Bell peppers and chili peppers in Kern County have been afflicted by cucumber mosaic virus (CMV) for the past several years. Some fields have had over 50% yield reduction due to CMV. There is no pattern as to when it or how severe the infection will be. However earlier in the season that CMV appears, the more severe the yield loss will be. CMV is a cucumovirus that is vectored by several different species of aphids, but most efficiently by Aphis gossypii and Myzus persicae, the cotton aphid and the green peach aphid respectively. It is transmitted in a non-persistent manner, meaning the aphid vector acquires the virus after only a few minutes of feeding on an infected plant and that it can transmit the virus for a few hours afterward. Even though the plants are being treated with a systemic insecticide from the time they are young seedlings, fields are still being infected with CMV. The reason for this is most likely because once an aphid lands on a plant surface it immediately begins to probe the plant to see if it is a suitable host plant. Once this probing begins the virus is transmitted to the plant. Even if the aphid is killed by the insecticide, it is not killed quickly enough to prevent the vectoring of the virus. Although treating pepper fields with imidacloprid does reduce the buildup of aphids in field, it does not prevent viruses from being introduced to a field. 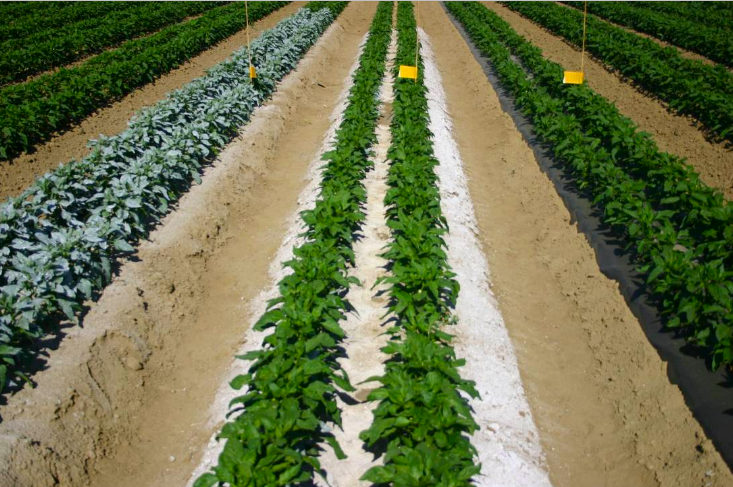 A trial was conducted in spring of 2009 with bell peppers to determine if CMV can be controlled by the use of various mulches. 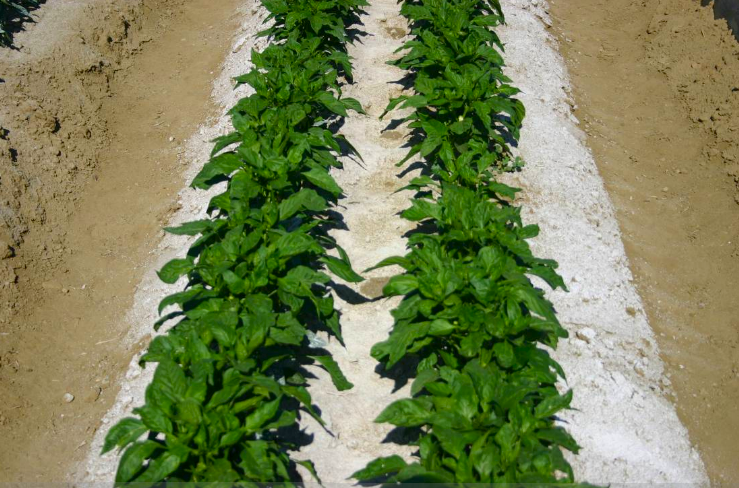 In 2008 it was determined that silver reflective mulch and float row covers could reduce the number of aphids landing on pepper plants which then resulted in lower CMV incidence. 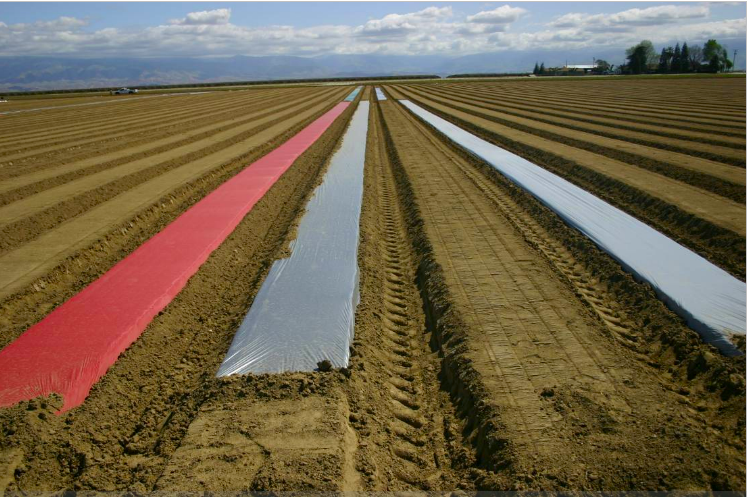 For 2009 more types of plastic mulches were tried along with a floating row cover. Also a spray on white mulch was tried along with a whitewash of the pepper canopy. The spray on mulch and whitewash was composed of Surround, a commercially available form of kaolin clay. Each plot was one bed by 100ft. Transplant bell peppers where planted by hand on a 12 in row spacing. Each treatment was replicated 4 times. The trial was planted in a commercial bell pepper field which also had several adjacent chili and other bell pepper fields. The trial was evaluated for aphid counts on a weekly basis by placing yellow sticky cards just above the plant canopy. The traps were moved up slightly each week as the canopy grew taller. Thrips were also counted this year on a weekly basis on the same traps. The peppers were harvested by one picking of 20 feet of row. All marketable peppers were harvested within those 20 feet. The aphid pressure was very low for spring 2009 in the Mettler area of Kern County (figure 1 and 3). Aphid counts were generally less than 5 per week as compared to 10 times that number in 2008. As a result of the low aphid pressure there was not any CMV present in the plot area or in the field. Figure 3 does show however that the control still had the highest number of aphids trapped while the floating row cover did the best in preventing aphids from landing on the pepper plants. All the other colored mulches had lower counts compared to the control with the silver reflective and silver mulch performing the best of the other treatments. Thrips were in abundance as shown in figures 2 and 4. The white mulch and green mulch increased the thrips found in the canopy as compared to the control. Again the floating row cover reduced the insect populations the greatest amount with the silver reflective mulch and the silver mulch reducing the thrip numbers as compared to the control. The floating row cover reduced the number and weight of the fruit harvested (tables 1 and 2). These plants were much taller with very little fruit on the plants (data not shown). The red and green mulches significantly increased the number and weight of the peppers harvested as compared to the control (table 1 and 2). Although not significant, all the other mulches also increased the total number of peppers compared to the control (table 1b). The black and silver mulches along with the white sprayed on mulch and the white wash also had higher yields than the control. Aphid pressure was essentially nonexistent in spring 2009 which resulted in CMV not being present in the test plot area. Thrips were in high numbers and could be reduced by the silver reflective and silver mulch as well as by the floating row cover. Without CMV pressure, green and red mulches increased the number and weight of the harvested bell peppers. The other colored mulches appear to benefit the yields also. The use of the floating row cover had a negative impact on fruit yields. This may be due to the shading effect of the floating row cover. Although these plants were very vigorous and healthy they did not set many fruit. In the presence of CMV these results may have been different. The silver reflective and silver mulch did reduced aphid numbers and if CMV was being vectored then these treatments would likely have performed the best. Red, silver, control and white mulches. White wash, white sprayed on and black mulch. Figure 1a. Number of pepper fruit harvested in 20 feet of row. Figure 1b. Number of pepper fruit harvested in 20 feet of row. Figure 2a. Weight in pounds of pepper fruit harvested in 20 feet of row. Figure 2b. Weight in pounds of pepper fruit harvested in 20 feet of row. Figure 1. Weekly aphid counts on yellow sticky traps. Figure 2. Weekly thrips counts on yellow sticky traps. Figure 3. Average weekly aphid counts. Figure 4. Average weekly thrips counts. Silver much and whitewash on soil also appeared to work well. White plastic mulch made thrip counts worse.